I've happy to host Genese Davis, author of the upcoming The Holder's Dominion, as part of her on-going blog tour. As a fellow English major from The University of Texas and a gamer girl, I was intrigued by her background in videogame creation and her book reads like the best sort of videogame on paper, full of action, drama and intrigue. 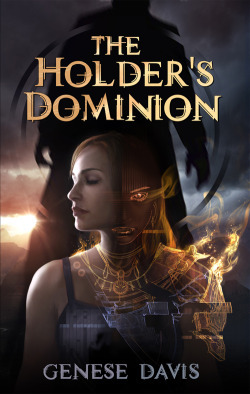 You can learn more about Genese and The Holder's Dominion at her website as well as visit The Gamer In You, where she's exploring what it means to be called a "gamer". Genese's debut novel, The Holder's Dominion, will be released next month by Beaver's Pond Press. Whether you’re an avid gamer or about to log in for the first time, chances are high that you’ll hear that running joke over and over again. But the truth of the matter: women have a significant presence in the world of video games, and not only as video game players. Women also hold significant influence in the creation of video games. From conception and design, to production and quality assurance, women are a part of every aspect of the video game industry. There are many professional women in the video game industry. Female artists create worlds and life-like models that will be essential for the game’s success. Female producers implement schedules and budgets, as well coordinate artist needs, and they oversee the entire game’s production pipeline from start to finish. Directors of production like Noel Wolfman have significant impact in the video game industry. Noel leads an entire department and overseas its production on a massive scale from conception to completion. When we hear the term “video game players”, people often think of a throng of children, or a group of men. However, the average age of every video game player is thirty-three. And the percentages for male and female video game players are getting closer and closer together. The facts: Statistics taken from the ESA (Entertainment Software Association, If it seems there are more men playing video games than women, remember that men are often more vocal about playing video games. If you keep asking and looking around, you’ll discover there are more and more women playing video games every day. Video games can improve everyone’s comfort level in social environments, but in particular, this is true for women. Video games teach players to think strategically, they force players to improvise, solve problems, and remain exceptionally aware. Learning these skills in-game are easily transferable into our social circles as well. Women can play video games and learn an array of new information about art, technology, programming, entertainment, and community, and transfer these experiences to their social networks. They will have new angles, skills, and tools for building camaraderie that can benefit all types of social environments. Healthy and content relationships blossom when both partners take a pro-active interest in each other’s lifestyle. By taking the time to play a video game together couples can bond, learn, and discover more about each other. They will be interacting on new micro and macro levels. Communication improves when playing video games together much more than when watching TV or movies. Video games require adaptation, and quick decision-making. Video games will constantly challenge couples to come up with strategies together. Video games can benefit relationships, bring people together, and improve our awareness and brainpower all at the same time. Women definitely impact the world of video games in a very real way. As players, designers, artists, and producers, we are fundamental pieces for the world of video games. Legacy storylines in video games are often created around inspiring female icons. Women influence various video game plots, themes, and characters and can access a whole spectrum of professional and personal skill sets through video games. The next time you hear that running joke about women not being a part of this industry, remember we’re there! And we’re excited to be a part of the video game industry on various micro and macro levels.